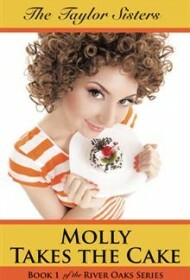 Heartwarming and entertaining, Molly Takes The Cake is a delightfully charming romance. Molly, the proprietor of Molly’s Sunshine Bakery in the small town of River Oaks, has been waiting patiently for Jared, the long-distance love of her life, to marry her and move to River Oaks so that they can start their life together. But Jared has different plans that don’t fit at all with what Molly envisions for her future. When Phil, one of Molly’s regular customers, needs a date to the wedding of the girl he loves that never loved him back, Molly agrees to go and pose as his girlfriend. The trip deepens their friendship, and there are even the faint whisperings of romance, but poor timing is a major issue for this couple. This cleverly written romance follows Molly and Phil on their sometimes hilarious, often touching misadventures, as they navigate the tricky waters of love, relationships, and friendship surrounded by a cast of unique characters. Surprising plot twists and hilarious scenes, including a fantastically described wedding cake fight, are balanced by poignant emotion and an underlying theme of faith in God. Molly and Phil must face their pasts in order to get to the future they both clearly deserve. The story is complete in itself, but it is only the beginning of what seems to be a very promising series. The authors have left plenty of room to expand on the world of River Oaks and its many memorable characters. Wonderfully expressive writing, captivating characters, and a richly constructed story make this book a great read for any romance fan.